Right, this year I thought I'd do sale shopping properly on the blog. No mucking about! As all the sale dates start at different times I thought the easiest way was to group into sections and if any other sales come in at a later point to do a round up of them underneath it. Hope it works and do let me know if you make a purchase, tag it with my Instagram handle here. I thought that every one would be doing the sales round ups so you're probably reading this having seen 10 edits already. So, what kind I do differently?! How about show you the sale items that make up 80% of my wish list? That would be stripes. For example, this J Crew dress with it's awesome blur, red and roped detailing has been in my basket for months - and it's now on it's way to me, yay! 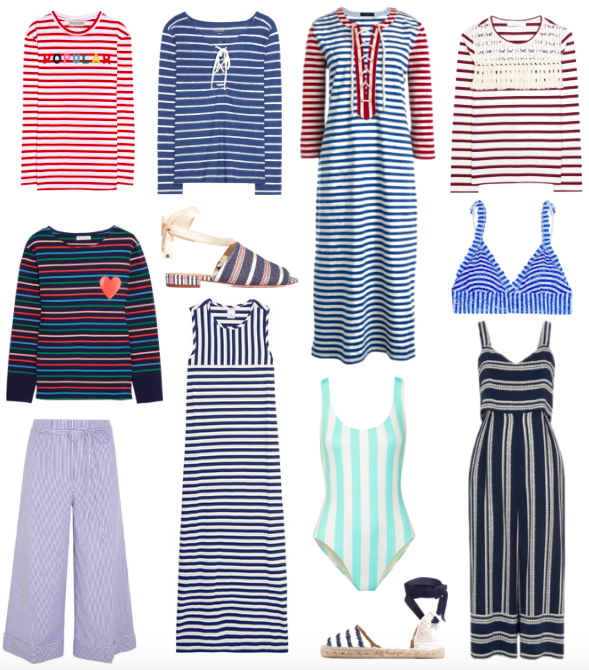 When it comes to Breton tops there is no such thing as too many in my book. I have t shirt material ones for weekends, thicker ones for smarter occasions and a couple of logo details etc (like this Popular tee that I've been after for ages). Ones I've spotted include this Chloe one for a bargain £81 with the lace detailing, and this brilliant navy and coloured option from Chinti and Parker who you just know is going to give you brilliant quality. I'm going to to try and write this all down without going giddy because some of the discounts are just absolutely unbelievable. 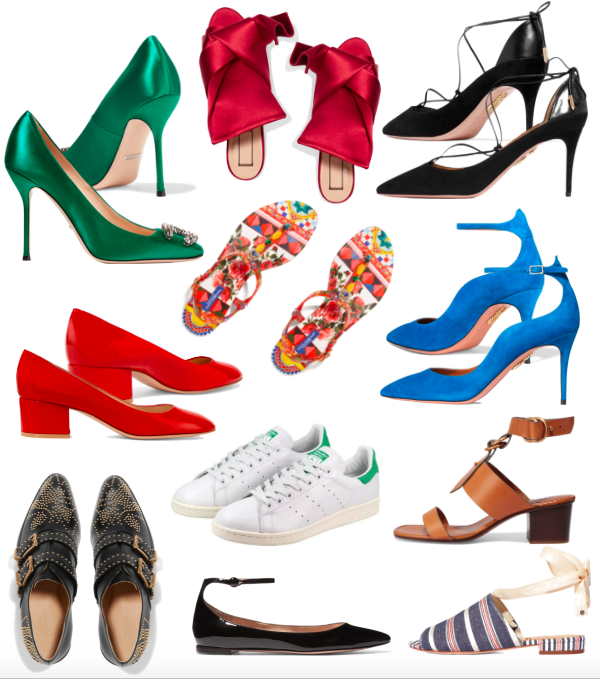 Within Net A Porter there are two brands I hit first; Aquazzura and Gianvito Rossi. Their shoes are such good quality and for some reason (to our advantage) heavily reduced. For me Aquazzura are like the Jimmy Choo of the modern day! Their hero styles; the Belgravia (you'll see when you click they're the style every, single high street store has copied) and the Fellini are both 50% off in black - this never happens! If you're after a staple, neutral black heel and flat make them to two you go for! For Gianvito Rossi, I just can't get my head around it. Why so discounted? I think someone in the buying team must have hit an extra "0" on the wholesale order because these are sell out shoes!? Their patent leather heeled pumps (in red and in black) are just so, so good. I've bought myself a pair just because I know I'll have them forever. Oh and if you're a flats girl, let these be the pair to show you quite why a girl like me now swears by designer shoes (in the sale). As a couple of further points I cannot believe the Chloe Susanna shoe has gone in to sale, let alone at 40%, here. Always check out Tory Burch and Sam Edelman (a few of my faves in the above edit) because they do brilliant holiday footwear, like this pair that are £50 and this pair that are a really cute twist on the gladiator sandal. Also, I'm not sure how Dolce and Gabbana got in here but these sandals (also shown in the edit I made) are a bargain at 40% off. Lastly, Stan Smiths have gone into sale. I don't get it either but I'm down with it - I bought this pair.